Oxalate: The Truth About Oxalate - Is Kale Bad For Us After All? But is it true? Are high-oxalate foods dangerous? Should we be avoiding them and cutting them out of our diet? Should these high-alkaline foods like kale, spinach, beets, celery, bell pepper be cut? Let’s face it, the LAST THING we need is MORE confusion, more conflicting advice and more back and forth over what we REALLY should be eating. In this video I cut through the confusion and give you the straight answer: should we be eating or avoiding high-oxalate foods? It’s heartbreaking when we do what we believe are ALL the right things for our health and then one day we find out that all of those things we thought were so good are actually making things worse. And one that’s causing a LOT of confusion is the recently popular debate around oxalate. All of a sudden – over the past couple of years it seems like there are so many messages out there saying – don’t eat kale, don’t eat so many greens – worry about the oxalate content! If you’re anything like me – and I suspect you are if you’re watching this video – you tend to think that leafy green foods are awesome, you include them in your juices and smoothies and you believe them to be doing a ton of good for your body and your energy. So this message is confusing, conflicting and frustrating. If there is anything we need LESS of when it comes to our health – it’s confusion or more conflicting advice. And so today I want to clear everything up for you – remove this confusion and give you the truth about the issue with oxalate. I want you to be able to move forward with confidence and know that what you’re doing for your body is AWESOME and not doing more harm than good. Hey, I’m Ross Bridgeford – the creator of the Alkaline Reset Cleanse and the founder of Liveenergized.com and in this video I’m going to end this debate on kale and bell pepper. Kale – the seemingly champion of the oxalate-containing foods, and bell pepper – the hero of the nightshades. I’m going to answer the question mark that has come up in the past year or two as to whether we should be worried about foods containing oxalate – and whether this is damaging and deleterious to your kidneys and thyroid. It’s so important that when you’re putting huge effort in with your health that you feel confident in the choices you’re making. So as a background and before we dig into WHY there is the debate over these oxalate-containing foods, and uncovering what the truth is – let’s have a quick look at what those foods are that it’s suddenly become popular to try and denounce. A lot of these foods are all pretty abundant in my diet. And in my Alkaline Reset Cleanse we juice and smoothie and soup them daily and feel AMAZING. But we keep being told they’re BAD for us? What’s going on? OK, so oxalate is a small molecule found in plants – particularly those I listed before. If you love the science of it – it’s made of two carbons and four oxygen with a charge of -2, making it attracted to other molecules with a charge of +2; especially calcium and to a lesser extent magnesium. So we ingest it through certain plant foods, but importantly – our body also makes a LOT oxalate as an end product of metabolism – and especially metabolizing fructose (and more on that in a minute). However, our bodies do not USE oxalate in any way, nor degrade it, and it has be eliminated through the urine or feces. And this is important too – even if oxalate intake is zero – if you completely 100% eliminate every oxalate-containing food on Earth – oxalate will be present in your body and need to be excreted in the urine as a result of normal metabolism. In other words – you can still have issues even if you ate NO oxalate-containing foods. So before we get too far into the debate – that’s important to know – your body will have oxalate in it no matter what you eat. Your BODY HAS TO BE ABLE TO DEAL WITH THE OXALATE. It has to be able to manage it. Remember that part. I talk a lot about balances in the body and this is another – your body has to have the carefully balanced mechanisms to be able to deal with and eliminate oxalate. So What Are the Problems with Oxalate? The theory that we’re being told is that because these foods – kale, spinach and so on are higher in oxalate than other foods that they can cause a number of issues in the body. These issues are most often discussed as kidney stone formation and thyroid function. Anyone with thyroid issues has now been rightly freaking out for the past few years – thinking they’ve been told to eat loads of veggies and especially leafy greens, but now all of a sudden those leafy greens could be making it WORSE? The theory is that if we consume oxalate containing foods then our body will be overrun with oxalate that is too much to handle and it can cause issues such as crystal build up in the thyroid, causing imbalance there – or the other most common highlighted issue – kidney stone formation. Aside from this there is hyper-oxa-luria – which has both primary and enteric versions. The primary hyper-oxa-luria is a genetic condition that affects around 1 in 1 million. That is very irrelevant to kale intake. The other – enteric is a result of digestive disorders such as leaky gut and Crohn’s – in which case, again, the consumption of leafy greens is absolutely not the issue here – the issue is with consumption of inflammatory foods such as sugar, gluten, processed foods and so on that has causes the autoimmune and inflammatory condition – and this condition is preventing the proper expelling of oxalate. If you have one of these condition you really NEED to be consuming MORE leafy greens to recover and heal the autoimmune condition – not restricting them! The bottom line here is that the conditions that lead to the body being unable to excrete oxalate ARE NOT CAUSED BY YOU EATING OXALATE. They are imbalances elsewhere in the body – caused by a standard western diet of sugar, gluten, processed foods, little-to-no greens, low levels of vegetables, too much junk food, not enough water, too much caffeine and alcohol – i.e an acidic diet, inflammatory diet – and the sickness, disease and imbalance that THIS type of lifestyle creates leads to the body’s inability to deal with the oxalate and do it’s job. These inflammatory conditions, autoimmune conditions, endocrine conditions – even if you ate ZERO oxalate, your body would still not be able to deal with the oxalate created through your normal body functioning. Especially given that the metabolism of these acidic foods creates way more oxalate than the metabolism of healthier, sugar-free, chemical-free, additive-free foods. We have to address the root cause. Just cutting out oxalate isn’t addressing this cause, it’s treating the symptom. It’s similar to taking a drug to treat the symptoms instead of addressing what’s causing the problem. You’re only slightly masking the symptom – and getting nowhere near fixing the problem. I want you to have the truth and I want to clear the confusion. I also want you to know that everything I do, everything I publish, everything I coach to my clients, the members of the Alkaline Base Camp, the people who go through my Alkaline Reset Cleanse – everything is evidence-based, tried and tested on myself and my thankfully willing family, but most importantly, rooted in scientific study and data. And that’s what makes this debate so interesting – because while there is a HUGE amount of so-called experts telling us that all of a sudden kale is bad for us, beets are bad for us. There are actually massive holes in that theory, and little to no scientific data or research to back it up. And as EVER – conventional medicine and nutrition advice focuses on that short term symptom masking (i.e the pharmaceutical industry) rather than really getting to the issue. I am absolutely keen for debate and for having my opinion changed by actual evidence and data, but until then – please do not stop eating these oxalate-containing foods. When it comes to the research – there seems to be some compelling evidence to show that the amount of oxalate CONSUMED doesn’t have a significant impact on the likelihood of you experiencing oxalate-based conditions. By FAR the biggest precursor to oxalate-based conditions is having a pre-existing digestive disorder or autoimmune condition: Crohn’s, IBS, leaky gut and so on OR a genetic condition such as cystic fibrosis or hyper-oxa-luria. 1) fat malabsorption – people with inflammatory digestive conditions such as Crohn’s and leaky gut are at greater risk of fat malabsorption, and is often caused in the system by high gluten consumption. The body’s inability to absorb fat dramatically impacts it’s ability to excrete oxalate. 3) Poor diet i.e. low magnesium and calcium consumption – in several of the studies, researchers saw big kinks in their data due to magnesium and calcium spikes in the controlled diets of participants. In a 2008 study – researchers gave participants a low-oxalate omnivore diet, a low-oxalate vegetarian diet and a high oxalate vegetarian diet – and the results after the study completed showed a lower oxalate impact in the high oxalate vegetarian diet than the low-oxalate diets. Why? Because the high oxalate diet also contained high levels of magnesium and calcium from the greens! Similarly in a 2014 study – 57 participants were randomly assigned to either a DASH-style diet (a regular vegetarian diet high in vegetables) or a low-oxalate diet – and found that the low-oxalate diet made no difference to oxalate excretion, but the DASH diet had a huge impact. Again – expected due to the increase in magnesium and calcium ingestion (and as an aside they did note that an increased urinary pH was associated with the decrease impact of the oxalates – interesting). All of the research I have found has pointed to these factors. The research ALSO shows that a high-oxalate diet doesn’t make things worse. The urinary excretion of oxalate is similar on a high and low oxalate diet. However, those high oxalate foods that the media is revelling in trying to demonise – spinach, kale etc. are so potent at reversing autoimmune and inflammatory digestive conditions that you would be crazy to exclude them. The message is simple. Treat the cause, not the symptoms. 4) and lots of hydration – if you have any risk or worry of kidney stones or thyroid issues dehydration is hugely detrimental. Again – when you see hype – don’t believe it until you’ve peeled back a few layers. Look at the facts. People have LOVED writing headlines about Kale suddenly being BAD for you because it gets your attention and gets lots of traffic to their website. But there is no fact behind the hype. There is nothing about leafy green foods that will ever be bad for you! And be on the look out! If this 7 days of simply having a JUICE every day has been so powerful – can you imagine what 7 days of doing a full alkaline cleanse – having tons of juices, soups, smoothies could do for you? I’ve had a LOT of people asking me about doing an alkaline cleanse – the ins and outs and nuts and bolts – because it’s confusing, it’s not super easy and it’s very easy to get WRONG – making it a thousand times harder than it needs to be. So for the first time EVER – in about a week or so I will be running a totally FREE 3-part Alkaline Cleanse Workshop for you – teaching you all about how to do the cleanse, why it works and what you need to do to make it happen. Until then,if you’re excited about the cleanse workshop and you want to do a cleanse LET ME KNOW in the comments below this video! I can’t wait to get started. Doing a cleanse is SO powerful, it’s going to be amazing to teach you all about it. Hi Ross, thank you for all your research and understandable explanations. For years I have been trying to find the right diet, as I have a genetic predisposition for gout and try to avoid what brings on symtoms. For example, I used to do a 3 week asparagus diet in spring until I read how much uric acid they contain! I have downloaded your alkaline/acidic charts and see that goat’s milk is sorta OK. I eat very little meat, but I love cheese, especially hard cheese like cheddar and Manchego, but cheddar goes right to my big toe joint, making it inflamed and painful just like beef soup, which I cut out years ago. So my question is: if goat’s milk is OK, what about organic goat’s cheese in all forms, soft and hard? You don’t mention sheep’s milk products, which we have a lot of here in Salzburg, the mountain farmers producing ever more natural products including jogurt, soft and hard cheese, even a blue cheese. Could you please rate these products according to the chart before we begin on Monday? I’m so looking forward to this cleanse with you, to finally learn what I can allow myself of the mildly acidic foods, how much and how often. Thank you for your generous offer to share your knowledge with us. Can your book be purchased in Austria? I live in Salzburg. Hi, thanks for the oxcalate clarification. Q.- I’m signed up for the cleanse beginning March 4th, should I also sign up for the new 3part cleanse workshop mentioned in the oxcalate video? Q.- For cold symptoms or the day of singing rehearsal I drink a tea of fresh ginger boiled for 20 minutes, drained then honey, fresh lemon juice and a touch of cayenne pepper added to the water. What can I use in place of the honey as withoutit this the tea could be almost unpalatable? Hey Ross, still finishing your book, but, want (need) to start the 3 week reset/cleanse. Where do I sign up? Thanks for your Great work with nutrition. Considering oxalate containing vegetables What is your view on adding calcium salt to the meal as to forming chelates with oxalate ehich Can then be excreted unabsorbed in the feaces as calciumoxalate ? Ross, you absolutely ROCK!!! Your enthusiasm is contagious! Your knowledge, vast! SO looking forward to the Cleanse Workshop. See you Monday! I am in the middle of the alkaline cleanse as I had actually bought your book without being aware of you and your website. Consequently, I am looking forward to the workshop as questions do keep popping up. I will continue in the meantime and of course. can always do it again when you have the workshop. What if I don’t have a juicer? Can I use my blender? Thanks for the great articles and information. Hi Ross, when are you going to teach the 3 part cleanse? Would love to take it. I’ve taken the 7 day juice challenge and just finished the Alkaline Diet. Such wonderful information. I’m 71 and beginning to feel better, not so bloated and wake up with more energy. Thank you! I’m so pleased I’ve found your website! I’ve been diagnosed with breast cancer and, after much research, want to follow an alkaline diet. My question is this…..in relation to the juice/smoothie debate, what balance would you recommend i.e 80/20 % of time juicing to smoothies intake, 50/50 or what percentage would you think? I have lupus. Can the 7 day cleanse help. Please let me know if you will be repeating the Wednesday training. I will be on the road and really want to hear this. I am a big fsn!! HELP. If you register for it, you’ll be sent all info regarding repeats or replays. Where can I get Alkaline Cleanse Workshop? If I’m worried about my osteoporosis do I need to worry about cutting down on these oxalates? I think that you are unfairly demonizing gluten and sugar. Sure sugar is bad for you, but it is no worse than an equivalent amount of chicken breast (or other meat), and it is probably considerably better given the salt. There are a lot of details behind this, but one example – Chicken breast raises blood sugar as much as pure sugar in pre-diabetics. By this logic I would not say sugar is OK and shouldn’t be demonized, I would say chicken is just as bad. Sugar and gluten are hugely damaging to the body. Other foods are too of course, and I accept your thoughts on chicken breast or other meat (I haven’t eaten meat in 21 years btw – I’m not trying to support that), but sugar and gluten deserve to be revealed for what they are. I have very active Rheumatoid Arthritis. Horrible decease. Looking forward to your cleanse workshop. It is truly horrible – nobody deserves to be in pain like RA brings so often. I truly hope I can help for you. Thank you Ross. I am one of those with thyroid issues. (Hypo). Had this problem for over 25 years and weight gain, hair loss, leg cramping etc. Although many have told me to stay away from Kale, (by the way broccoli too) as this worsens my symptoms, I do believe what you said in your video, that its the acidic foods that are causing these symptoms. I haven’t been juicing, as folks tell me that I am losing the benefits of the roughage and I don’t have the correct juicer. I have a filter system at home that is attached to my kitchen pipes. Even though I have only just started, some of the benefits I am seeing already, such as some weight loss, more energy, feel lighter, is due to reducing and stopping, milk, cheese, bread, rice and other foods mentioned in your videos. I look forward to the Alkaline Cleanse workshop. I have poly myalgia rheumatica, I have always. raten lots of fruit and vegetables all kinds, I wish I could get rid of it I have had this for 10 years, having to have wretched steroids. Can Ido anything elseformybody and health. This was a great explanation. Love that you back everything up with research (and common sense). Looking forward to the Alkaline Cleanse Workshop and to getting back on track. Recently became sluggish and put on weight to find out the thyroid was the problem. Can pregnant women follow any of your programs without putting a toxic burden on the fetus? What foods contain calcium and magnesium? thanks for the video and putting me straight about Kale not being bad for me !! I have signed up to your cleanse workshop, and am looking forward to that! 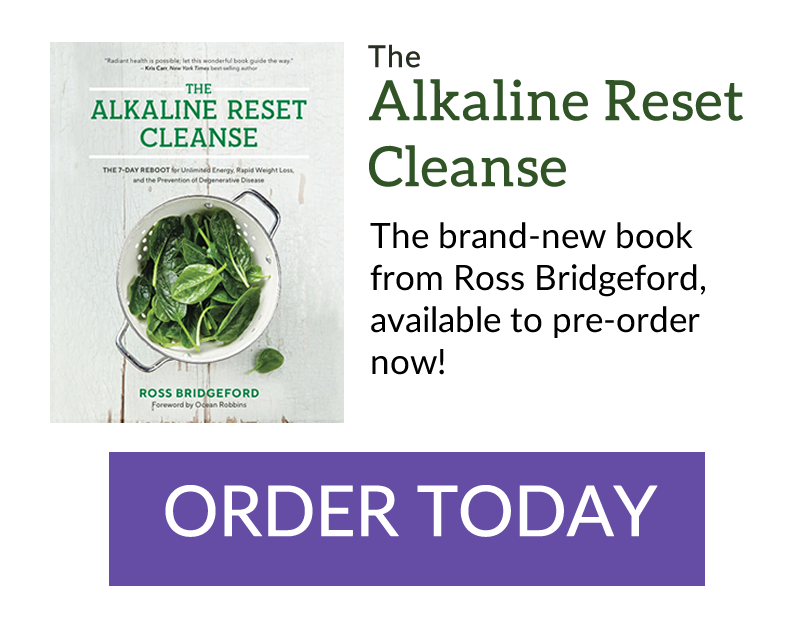 I live in the UK, and it seems as though your alkaline books are not available here. Strange as it seems to me as I thought that you would have been a best seller over here. Maybe you need to have a word with your publishers. Im planning on getting a distiller or a bigger filter for water. Does the distiller negatively effect minerals? Surely minerals come from plants anyway. I did hear a about that at one point but could do with your input. I cant afford anything expensive so maybe even one step up from a britta filter would do. Thank you for the video explaining everything. I have arthritis in my fingers and digestive problems. I have been a vegetarian for 43 years. I always thought I ate well but I did have digestive problems my whole life. I loved ice cream, cheese, and breads along with fruit, vegetables and nuts. I am ready to do things right. Is the sugar in water kefir bad for breast cancer patient who finished with chemo and radiation . Should I cut the cheese ? My brother has chones and believes he can’t eat any healthy foods and on top of that we are twins and both are mild hemophiliacs so surgery for anything is a big risk. Can a hi oscolate diet reverse chrones. Thanks. Thanks Ross for clearing up some confusing things for my Hashimotos healthy diet. I’ve been gluten free for a few years and the results have been astounding….now all this stuff about the greens I shouldn’t be eating threw me for a real loop. Also, I’ve watched and participated in your videos 1 2 &3 and . I AM READY TO JOIN YOUR ALKALINE DETOX CLEANS 2017…so excited….but I’m unable to find where I can pay to join. Help please. Hey Lisa – I’ll be explaining everything in my next, and last, video in this workshop – which is coming out on Wednesday. Can’t wait to have you in the group! I have had kidney stones and some was removed. Still have a piece left. Thank you … great video. Very informative. Super excited to participate in the alkaline cleanse !!! Thanks for this valuable information Ross – really love that you have both the video and the written info for a kinesthetic person such as myself. Is chlorophyl purchased from health shops a good addition/supplement for green leafy vegetables that are commercially grown (non organic greens, that is) which I believe lack good nutritional value? Thank you Ross for once again bringing such amazing facts and debunking all these crazy headlines that are designed to keep us ignorant and sick. So excited about the upcoming cleanse workshop. I am working on getting the Hashimoto’s in remission as well as digestive issues resolved once and for all and I too have done my research and know that everything you have said is accurate and I hope the word continues to spread rapidly so others too can benefit and pass it on! Blessings to you Ross for all the amazing things you do to help us regain our health. I am so inspired by you today that I am about the make myself a beautiful leafy green smoothly to celebrate! Cheers to good health! I am very interested in the Alkaline Cleanse Workshop that you will be doing. This is a brilliant article. I am so glad someone as smart as you have finally cleared the fluff about Oxalate. I really appreciate the depth of this article and I will be sharing it with all my readers and followers! I have no gallbladder and you say that fat malabsorption is a risk factor. what ways can I combat this problem. it is having a huge impact on my diet as I am trying the alkaline with lots of healthy fats but still not able to tolerate them. I know digestive enzymes exist but its not low stomach acid but lack of extra bile excreted at the time it is needed that is the problem and I fear if I take them then it will inhibit my own production of stomach acid. My study of food brought me to soaking, sprouting, or souring grains, nuts, legumes before consumption to eliminate phytates (anti nutrients). I’d also read that cooking greens removes oxalates. I still eat more fresh than cooked, but a person with above mentioned issues might steam greens until they can handle more raw. What do you think? Note to Lisa: I have read that coconut oil (NEVER hydrogenated coconut oil) is the only fat that someone without a gall bladder can handle. I can say that through personal experience and testing that I feel fantastic after having a vegetable smoothie in the morning containing kale, spinach, and others… way better than let’s say eggs with bacon, or a grain based breakfast. Green vegetables make me feel healthy for sure! Thank you so much for teaching and wisdom that you are sharing. Hello Ross, thank you so much for clearing up that controversial bit of information about oxalates. It was a bit of a concern to me. I have been following Yuri Elkaim’s Program for the last 2 years fairly well, with some occasional relapses. His program is very close to your program and I am doing well on it if followed. I do not have a juicer mainly because of the work of cleaning it daily. I am using a Vitamix for my smoothies and I think the fiber is anyway good for me. I am certainly interested in taking your Alkaline workshop when you are giving it. I trust you as much as Yuri Elkaim, I have a good feeling about both of you. Thank you for all your good information. Thank you for answering this question. I have wondered about this for some time and am so happy to have some clear guidance on it. Also excited to do the cleanse. i enjoyed your video on Oxalate in veges , I’m quite keen to do the Alkaline cleanse Work shop. Can diabetes be reversed? And if so, can it be done without prescription mess? Can diabetes be reversed,? And if so, can it be done without prescription meds. I actually emailed this exact question to you a couple of years ago, after advice given to me by a friend and I appreciated hearing your response again here in this post. Great work, so appreciate your efforts. I would like to be kept informed about the upcoming cleanse please. I am due for a reset! Once again you come to our rescue with your knowledge and research. Thank you so much for clarifying this topic. Yes, I’m very keen for the Cleanse workshop. I bought the Reset cleanse a year ago and still haven’t tried it, a bit of nerves and a bit of feeling overwhelmed with the planning and prep (I work full days and commute, so my time at home is limited). I think the video workshop will help me with approaching it with the right frame of mind. Awesome Ross ! Once again you’ve shared valuable life changing information! Thank you so much! I can’t wait for the Alkaline cleanse workshop. I Love the sense of community and knowing there are others in this journey of life and vitality healthy lifestyle so we can be the best “me” we can be. I’ve been following you for a while now and have been enjoying the juices /recipes. Bit of info: I am a (usually) fit, healthy 60 yr old female (I’m a runner). However, I had surgery for colon cancer in June and am now undertaking chemo. This has really knocked me for 12 let alone 6! It’s making me too nauseous to even think about food let alone good healthy juices. I’ve lost weight too. Can you suggest anything for me to do to counter this and get me back on my road to recovery and wellbeing?